It was a summer night at two in the morning when our smoke detector went off. A fire had started in the laundry room. By the time the fire department arrived and put it out, our kitchen and den were destroyed, and the rest of the house was a smoke-damaged mess. The first person we called the next morning was the insurance agent. Our second phone call was to Roger Perron. Roger arrived about an hour later to assess the damage and to help us figure out the next steps. 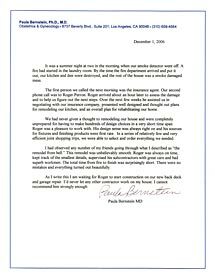 Over the next few weeks he assisted us in negotiating with our insurance company, presented well-designed and thought-out plans for remodeling our kitchen, and an overall plan for rehabilitating our home. We had never given a thought to remodeling our house and were completely unprepared for having to make hundreds of design choices in a very short time span. Roger was a pleasure to work with. His design sense was always right on and his sources for fixtures and finishing products were first rate. In a series of relatively few and very efficient joint shopping trips, we were able to select and order everything we needed. I had observed any number of my friends going through what I described as "the remodel from hell." This remodel was unbelievably smooth. Roger was always on time, kept track of the smallest details, supervised his subcontractors with great care and had superb workmen. The total time from fire to finish was surprisingly short. There were no mistakes and everything turned out beautifully. As I write this I am waiting for Roger to start construction on our new back deck and garage repair. I’d never let any other contractor work on my house. I cannot recommend him strongly enough.